Keep checking back to see where the best Spring Break parties in Punta Cana will be happening. New events and artists are being added daily. The schedule will be updated schedule right up through Spring Break and parties and artists are subject to change without notice. ORO Nightclub at the Hard Rock Hotel & Casino is the ultimate most exclusive nightclub of Dominican Republic. Experience World Class DJs, special themes and performances. Enjoy full access to the Hard Rock Casino where you can try your luck on Black Jack, Slots, Roulette or Craps. Once a year college kids flock to our epic VIP floating party! The STS Staff have found the best of the best when it comes to booze cruises, rafting up with other boats in chest deep water lets you cool off as the party heats up. Right off the coast of the Dominican Republic we keep the party going and the drinks flowing! With DJ's aboard the ship its a nonstop riot! You do not want to miss out of the party of the week. From the time the boat leave the dock the party is hot, the drinks are cold and you're sure to have a blast. Immerse yourself in a Vegas style show, with performances happening in a 360 degree view featuring singers, dancers and acrobats. Coco Bongo is known for its spectacular shows. STS Travel's VIP Party Package not only gets you express entry and an Open Bar all night but we also set you up with the right in the middle of all the action! With all of the Spring Breakers we bring in the party is unreal! The club has a cutting edge lighting and sound system and large screens for projected images.Vegas Showtime Meets the Party! Get ready for the most incredible high energy show you have ever seen! The Imagine nightclub may be an underground cave but our VIP Party will have you shouting from the mountain tops! We don't just get you in first, we set you up with free pouring open bar all night long. 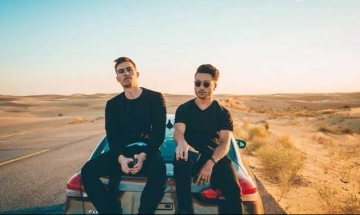 We booked a performance from DJ's Loud Luxury, Canadian DJ duo consisting of Andrew Fedyk and Joe Depace In 2017, they released a remix of the Martin Garrix single "Scared to Be Lonely", which gained fame. Each cavern has its own twist from top 40, Reggae-ton, Hip Hop and R & B and if you're looking to transport yourself out of reality Imagine has the most powerful sound system in Punta Cana offering House music and the perfect light show to match. STS staff know how to party and this is our MAIN EVENT! The Imagine nightclub may be an underground cave but our VIP Party will have you shouting from the mountain tops! We don't just get you in first, we set you up with free pouring open bar all night long. Each cavern has its own twist from top 40, Reggae-ton, Hip Hop and R & B and if you're looking to transport yourself out of reality Imagine has the most powerful sound system in Punta Cana offering House music and the perfect light show to match.